Doors ~ more than an entrance to a home. It’s a style statement that sets the stage and expectations for what lies inside. Yes, it’s a reflection of a home. 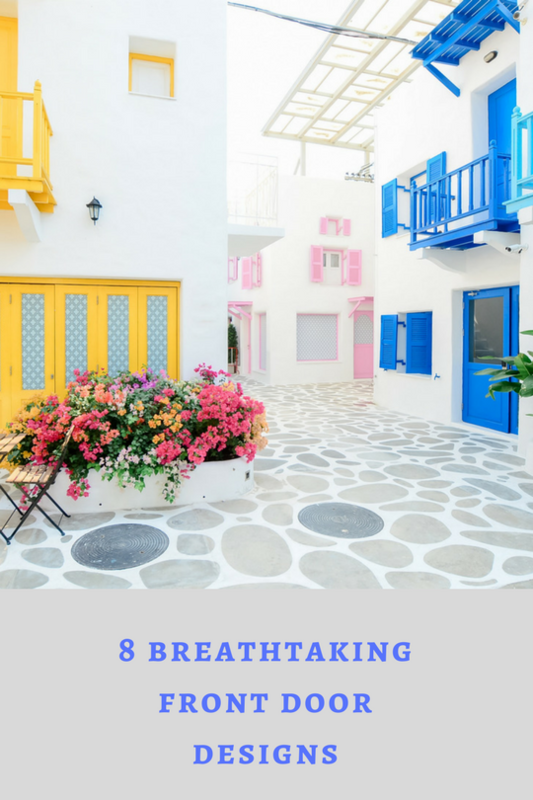 You spot a stylish front door, and you can’t wait to step in and see the rest of the home. Front doors are like the cover of a book. But, the adage does not hold good for a home. You can judge the style and interiors of a home by its entryway where the best is often on display. I spent a good part of my growing up years at my grandparents’ in two southern towns of Tamil Nadu: Madurai and Kumbakonam. The architecture of the ancient houses in Tanjore district has left a lasting impression on me. Several hot summer afternoons spent playing hide and seek in the thinnais (the front porch), mitham (the courtyard) around the wide thoons (pillars) and maadi (open terrace) and behind those huge small teak wood doors leaves a bit of nostalgia, you see. 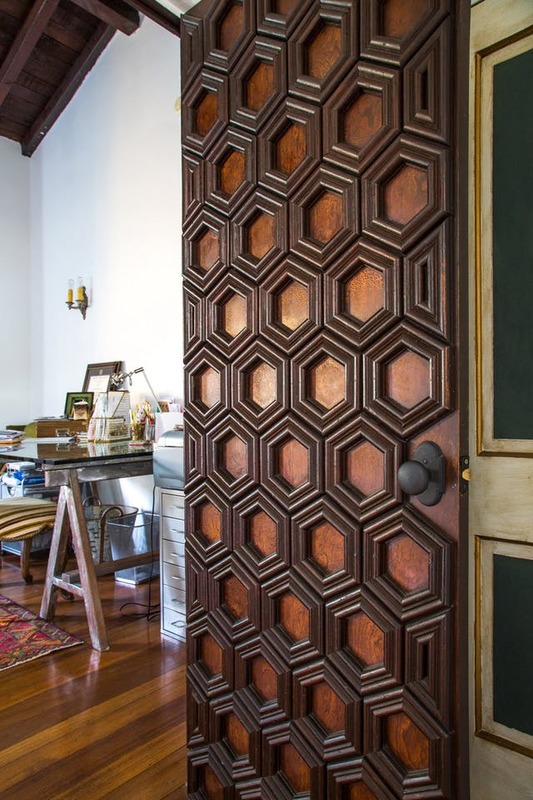 To this day, when I think of main doors, the first image that comes to mind is the heavy main door at my grandma’s which is over 140 years old now; it looks very similar to this one. 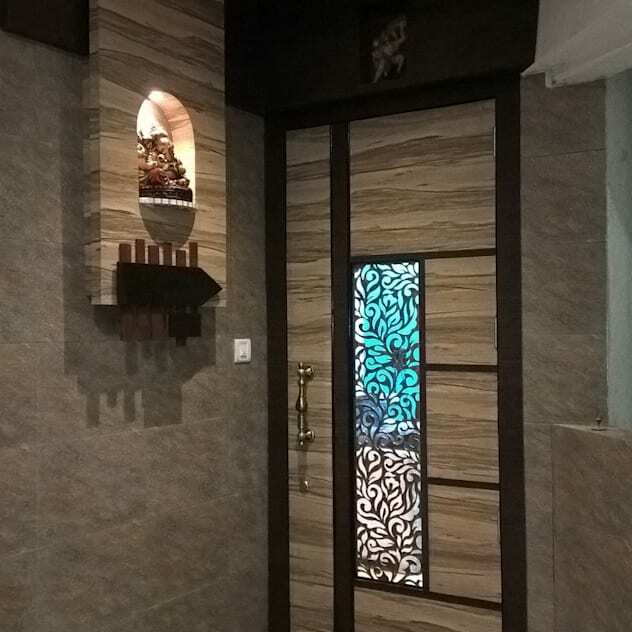 This is the magnificent entrance of an apartment in Gurgaon. 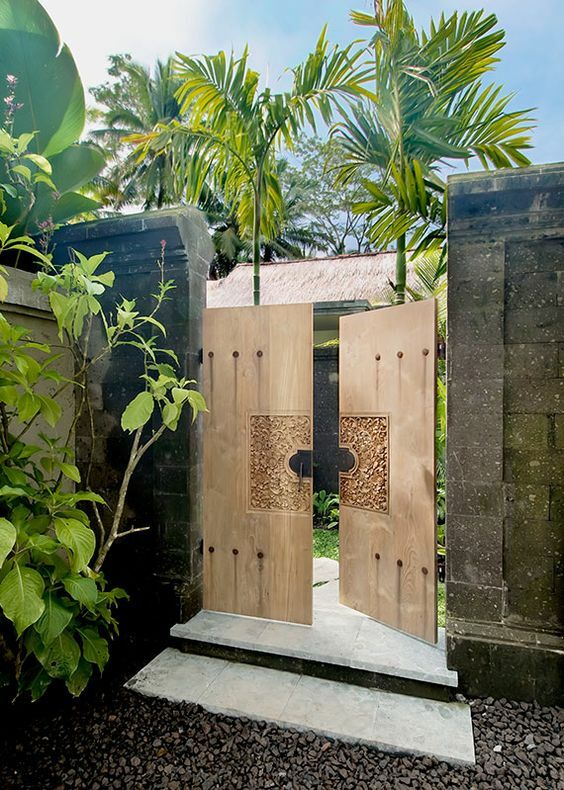 The teak solid wood door has traditional carving on it and is fitted with antique handles. 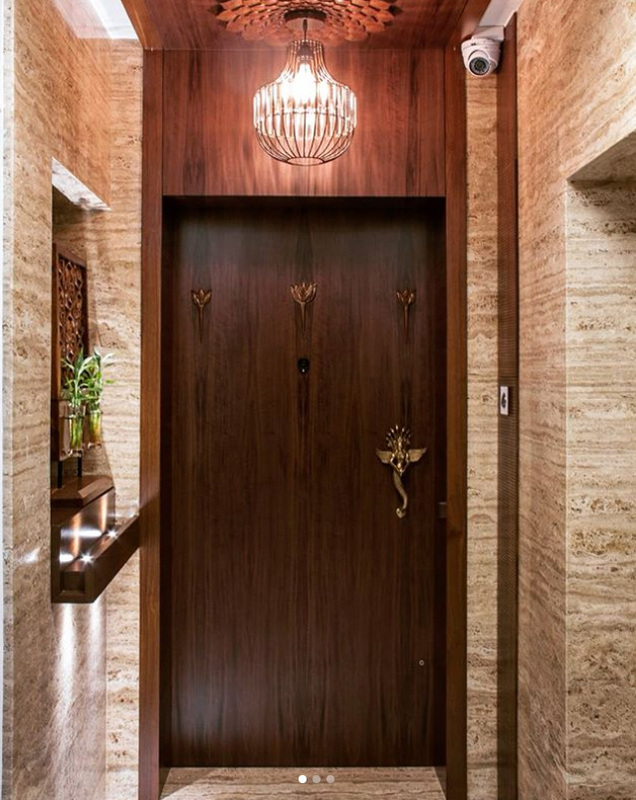 Flanked by a Ganesha on one wall and carved flowers on the other, this one redefines elegance. 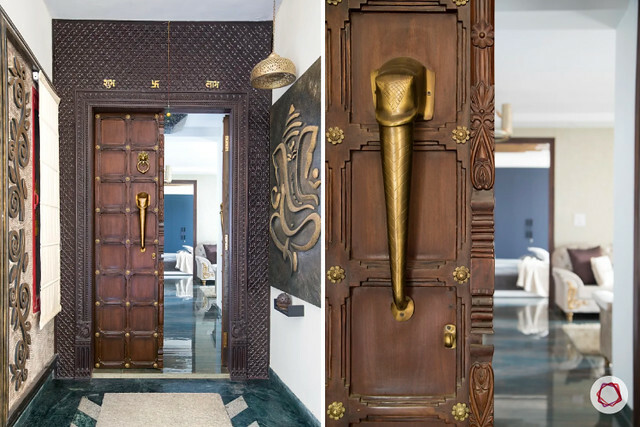 An engraved art panel in an otherwise simple wooden door steps up the style game here. An image of Ganesha is considered auspicious, and you will often find either an idol or tile cladding at the entrance of several Indian homes. Stone wall cladding brings in warmth to the space and blends well with wood. This is a creative and cheap way to renovate your existing front door. 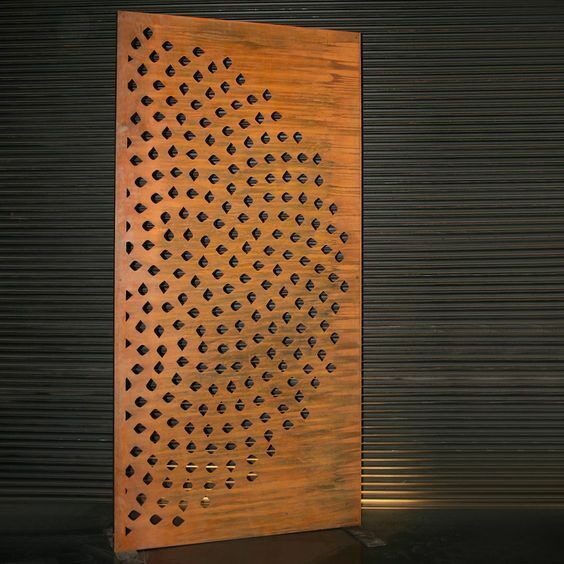 Clad your door with wooden panels of a design of your choice to create a three-dimensional effect and visual depth. 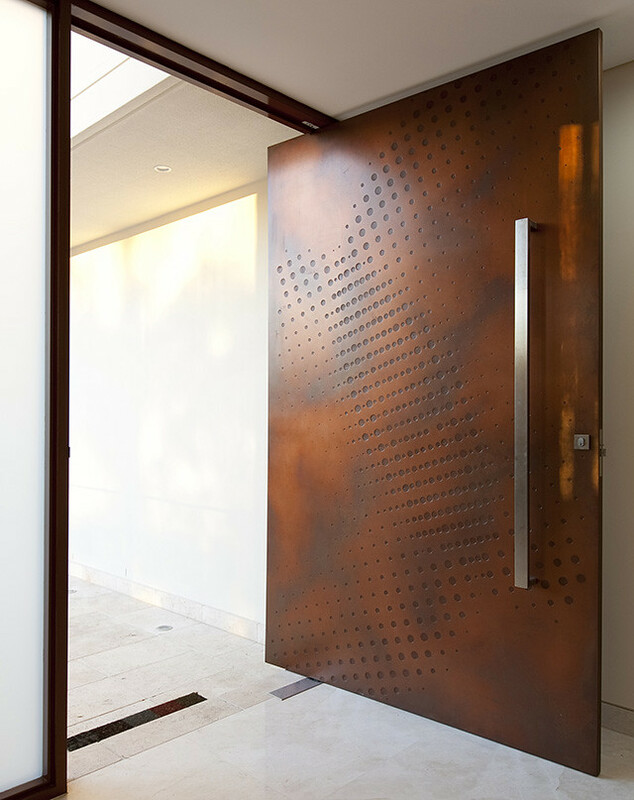 This is my kinda door: simple, modern, futuristic and textured. 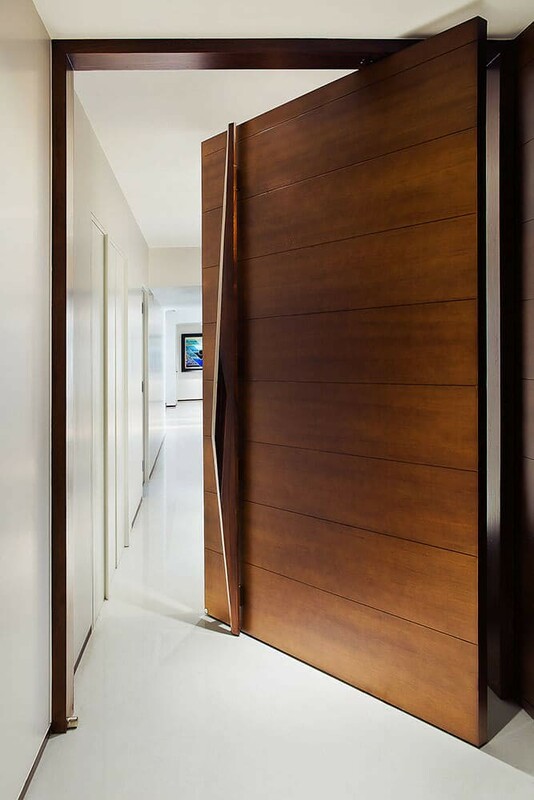 This 9-foot tall pivot door leads fro the foyer into gallery making it the pivotal element of this Juhu apartment designed by Kaizad Dinshaw. Laser cut patterns on front doors are beautiful. One can perhaps choose to be conservative in the number of cut panels to protect privacy. A semi circle tear drop design such as this one is beautiful. This is an offbeat idea to re-purpose a screen divider as main door. The wood is not polished as the stains are still visible adding to the attractiveness factor. The central patch of carving offsets the smooth exteriors. Hi Laksh, was looking around for blogs or sites from people in bangalore, to know more and to care of my potted plants in my balcony. i like your site – well done up, useful information and has a warmth in it, just like the home you would like to dress up. will come back to you for more help. If you are looking for colorful small pots to plant herbs and such, then the ones in Hypercity (Brookefields) might be to your liking. 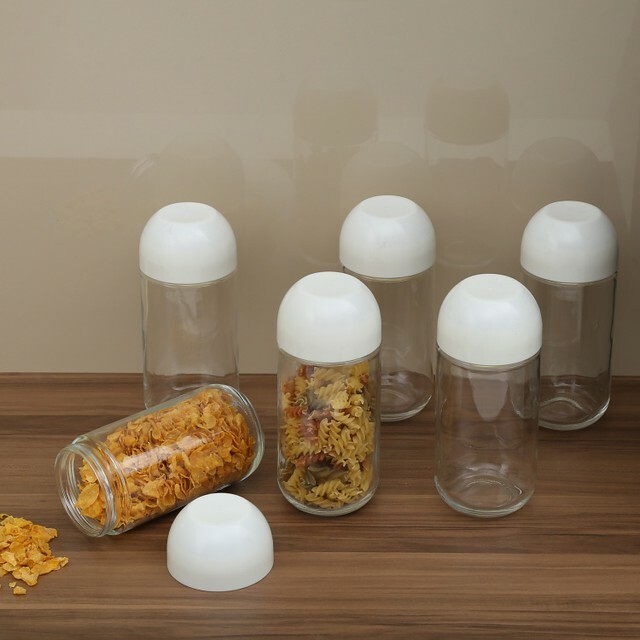 They are for Rs.59-Rs.100. There are many available on the roadside too. @ Home, Home Town, and Lifestyle do stock a variety of ceramic pots but they are on the expensive side.